The old foes will meet again when Juventus face Barcelona in tonight’s Champions League final. Luis Suarez and Patrice Evra. PATRICE EVRA WILL shake Luis Suarez’s hand before tonight’s Champions League final and then plans to make his presence felt by the Barcelona forward during the match in Berlin. 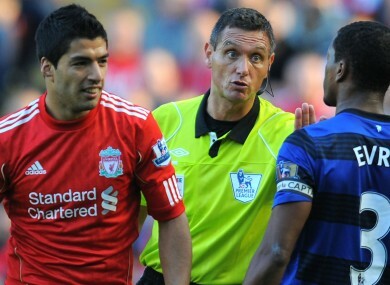 Suarez was banned for eight matches in 2011 after the Football Association found the Uruguay international guilty of racially abusing Evra during a clash between Liverpool and Manchester United. There was more controversy when Suarez refused to shake France left-back Evra’s hand at Old Trafford when the two players met for the first time after his suspension. Evra revealed that Suarez, who stressed that he is not a racist, has not apologised, but the Juventus defender will not snub the Barca forward when the Serie A winners attempt to be crowned European champions for the first time since 1996. He told ITV Sport: “I don’t want his apologies. It doesn’t matter, it’s no problem for me. But when we are going to play the game, I will shake his hand. He will never be my best friend, but this is not a problem. Email “Evra: I don't want Suarez's apologies”. Feedback on “Evra: I don't want Suarez's apologies”.